Many of my students with language impairment struggle to answer WH-questions correctly. They need my help to figure out how to handle a question or just to determine what type of information someone is asking for when they use the different WH-question forms. 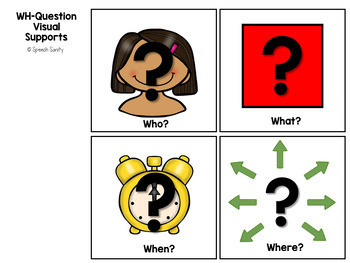 Many of my students rely on visual supports to help them learn these concepts. They also need lots of models and practice. With visual supports, models, and repeated practice, they begin to show improvement in this area. 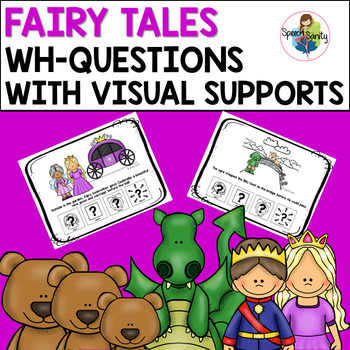 This resource, along with the others in this WH-question series, is something I created when working in Preschool and K-2 classrooms with students with developmental delays and Autism. These sets were all tried and tested by me and my special education teammates. We saw growth with students who really struggled with answering questions, including those who would just repeat the question back when asked. 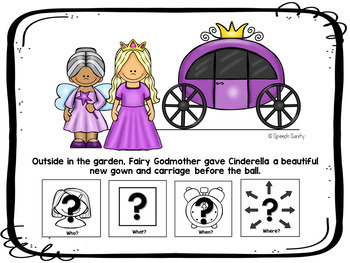 This resource includes 10 different FAIRY TALE themed WH-question scenes, as well as a set of WH-question form visual supports for WHO, WHAT, WHEN, and WHERE. 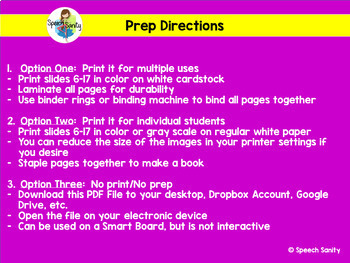 This resource includes multiple options for prep and use including: 1)printing and laminating a book for repeated uses, 2) printing paper copies for individual students to send home or leave with the classroom teacher, and 3) The NO PREP option to download it directly to your iPad, tablet, laptop, or smart board, etc. Earn Free TPT Credits toward future purchases! After downloading my product, provide feedback on your purchase to receive FREE TPT CREDITS toward future purchases! Simply click on "My Purchases", then find the product name and click the flashing link under it that says "Provide Feedback." Once you complete your rating and comments section, hit "Submit". Your free TpT credits will then be automatically credited to your account! Follow Speech Sanity for updates on future freebies, new products, and sales. To follow me, Click Here to View My Store! Then find the star next to my logo that says "Follow Me" and click it. It’s that easy!